This is an attempt to compare the cartridge destructiveness, gun power and gun efficiency of post-WW2 fighter guns. Fighter armament fits in three key periods are also considered. In the similar analysis carried out for World War 2 fighter armament, it was noted that there are two types of energy that may be transmitted to the target; kinetic and chemical. The kinetic energy is a function of the projectile weight and the velocity with which it hits the target. This velocity in turn depends on three factors: The muzzle velocity, the ballistic properties of the projectile, and the distance to the target. There are therefore two fixed elements in calculating the destructiveness of a projectile, its weight and chemical (high explosive or incendiary) content, and one variable element, its velocity. The key issue is the relationship between these three factors. A high muzzle velocity will provide a short flight time, which is advantageous in increasing the hit probability and extending the effective range, and will also improve the penetration of AP rounds. However, it might not add much to destructiveness, as unless an AP projectile hits armour plate (and not much of the volume of an aircraft is protected by this), a higher velocity just ensures that a neater hole is punched through the aircraft; the extra kinetic energy is wasted. Also, if the projectile is primarily relying on HE blast or incendiary effect, the velocity with which it strikes the target is almost immaterial. Provided that it hits with sufficient force to penetrate the skin and activate the fuze, the damage inflicted will remain constant. In contrast, AP projectiles lose effectiveness with increasing distance. It is sometimes argued that a projectile with a high muzzle velocity and a good ballistic shape (which reduces the rate at which the initial velocity is lost) provides a longer effective range. To some extent this is true, but the greatest limitation on range in air fighting remains the difficulty in hitting the target. The problem of hitting a target moving in three dimensions from another also moving in three dimensions (and probably at a different speed and on a different heading) requires a complex calculation of range, heading and relative speed, while bearing in mind the flight time and trajectory of the projectiles. Today, such a problem can easily be solved by a ballistic computer linked to a radar or laser rangefinder, but in the early years of this period the technical aids were far less sophisticated. And this was without considering the effects of air turbulence, G-forces when manoeuvring, and the stress of combat. For all of these reasons muzzle energy (one half of the projectile weight multiplied by the square of the velocity) has not been used to calculate kinetic damage as this would overstate the importance of velocity. Instead, momentum (projectile weight multiplied by muzzle velocity) has been used as an estimate of the kinetic damage inflicted by the projectile. It might be argued that even this overstates the importance of velocity in the case of high-capacity HE shells, as noted above, but the effect of velocity in improving hit probability is one measure of effectiveness which needs acknowledging, so it is given equal weighting with projectile weight. Chemical energy is generated by the high explosive or incendiary material carried by all air-fighting projectiles. First, there is the difference between HE and incendiary material, which are often mixed (in very varying proportions) in the same shell. HE delivers instant destruction by blast effect (plus possibly setting light to inflammable material within its blast radius), incendiaries burn on their passage through the target, setting light to anything inflammable they meet on the way. The relationship between the effectiveness of HE and incendiary material is difficult to assess. Bearing in mind that fire has been the big plane-killer, there appears to be no reason to rate HE as more important, so they have been treated as equal. 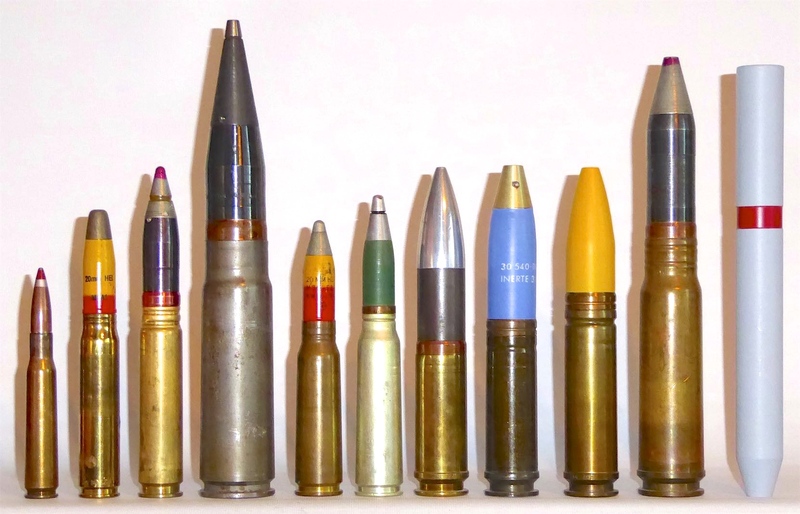 The following table for the most common cartridges and loadings used in aircraft guns shows the consequences of these assumptions and calculations. The first few columns should be self-explanatory, as these are basic statistics about the ammunition. The 'DAMAGE' column shows the results of the calculations described above. To run through an example, let us look at the case of the 30 x 113 B. The projectile weighs 270 g, (which equals 0.270 kg) and is fired at 720 m/s. Multiplying these gives 0.270 x 720 = 194.4, so you have a momentum factor of 194.4. As the bullet contains 17.2% by weight of incendiary material, the momentum is multiplied by 2.72 to give a destructive power score of 528.768 - rounded to 529. 'In the last column – 'Power' – the 'Damage' result is divided by ten and rounded to the nearest whole number (except for the 12.7 x 99) to simplify later calculations. Clearly, the resulting scores can only be approximate, and in particular will vary depending on the particular mix of types included in an ammunition belt. The power calculation takes a typical mix of ammunition, where known. They also take no account of the fact that some incendiary mixtures, and some types of HE, are more effective than others. However, they do provide a reasonable basis for comparison. There is no point in trying to be too precise, as the random factors involved in the destructive effects were considerable. The calculations concerning cartridge destructiveness shown above are valid for the early decades of the postwar period, but there is an argument that the importance of HE content has declined since then, for two reasons. The first is that the nature of the targets has changed: a typical modern fighter is a much bigger and heavier beast than its 1950s equivalent and has little empty volume inside (conversely, there are relatively few big bombers left in service). A thin-walled, high-capacity Minengeschoss type of HE projectile, as used very successfully in World War 2, would be of little use as penetration to an effective depth would be unlikely. As a result, modern HE shells are more strongly made, with the percentage HE content reduced acordingly. The second reason is that different types of projectile have been introduced, partly in response to the change in target characteristics. The most conventional of these are the SAPHEI rounds (base-fuzed, with a thick steel full-calibre penetrator containing a reduced quantity of HE) which are now the standard combat nature for both the 30x113B and 30x150B rounds made by Nexter of France for their revolver guns. In parallel with this, other kinds of multipurpose rounds combining HE, incendiary and armour penetrators have been developed, such as the 20x102 PGU-28 series in the USA (based on a Nammo design), and the new 25x137 APEX round, also from Nammo, which has a tungsten alloy penetrator contained within the HEI shell. 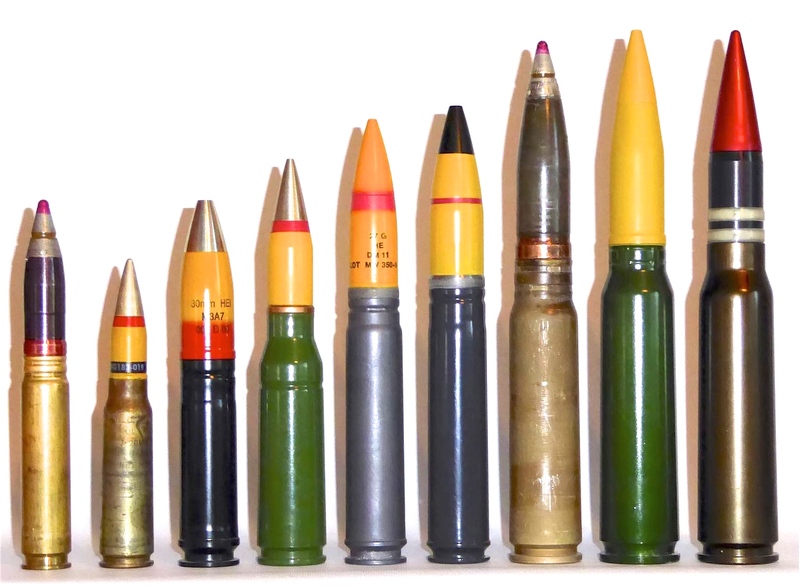 Finally, two modern types of multipurpose projectile have no chemical content at all: the FAP (Frangible Armour Piercing) initially made in 20x102 and 27x145B, and PELE (Penetrator with Enhanced Lateral Effect), available in various calibres. Both of these are designed to penetrate their targets before breaking up into a lethal shower of fragments, said to deliver destructive effects comparable with an HE shell. To calculate the destructive power of the gun, the 'POWER' factor from the above table has been multiplied by the RoF, expressed in the number of rounds fired per second. This gives the relative 'GUN POWER' figures in the table below. * The figures for the power-driven rotaries are for the full RoF. In practice, the figures in air combat will be lower because of the time taken to accelerate. For example, the M61A1 only fires 18 rounds in the first 0.5 seconds, and 68 rounds in the first full second of firing. In the first second, the gun power figure will be 1,496 and the efficiency 13.1. If only the first half-second of firing is counted, then the (full-second equivalent) figures become 792 for gun power and 6.9 for efficiency. The GAU-12/U has the same spin-up time as the M61A1, 0.4 sec, so will be affected about as much by this factor, with full-second scores of 2,592 and an efficiency of 21, and half-second scores of 1404 and 11.4. The spin-up time of the GAU-22/A, the new 4-barrel version of the GAU-12/U, is not yet known so it has been taken as 0.4 s as well. The gas-powered GSh-6-23 and GSh-6-30 will be affected far less, and spin-up time has been reduced to 0.25 sec for the lighter M61A2 for the lighter M61A2, improving its scores accordingly. Finally, a consideration of how the firepower of fighters compared with each other. The aircraft have been grouped in early postwar, 1954-1970, 1970-1990 and 1990+ fighters, and have been chosen to be representative of their period. The armament installations are listed in the second column. The specified weight is the weight of the bare guns and the ammunition. It does not include belt links, ammunition tanks, gun mounting points and recoil buffers, et cetera. The ammunition power value is the cartridge power value from Table 1, multiplied by the number of cartridges carried. The gun power value is the sum of the gun powers as in Table 2. The final column gives the time in seconds, needed to fire the equivalent of an ammunition power of 2320. The choice of this value is somewhat arbitrary; it was selected simply because the heaviest armed WW2 fighter – the Me 262 – was capable of delivering this firepower in one second, so it enables easy comparisons to be made. 'Two 'Time to Fire' figures are given for the American rotaries; the slower time is from a standing start, the faster one assumes that it is spinning at maximum rate throughout. The fighters are here divided into four groups. The first group, which entered service in the late 1940s and early 1950s, was subsonic in level flight and had guns as main armament. Most of these fighters carried an improved form of WWII armament, with guns that were technically refined and had a higher rate of fire. One fundamental change in comparison with WWII is that, with the exception of the hugely successful MiG-15 (and the improved MiG-17) all had homogenous armament. The practice of fitting multiple types of gun to a fighter was abandoned by most nations. In 1953 the Hawker Hunter entered service with an armament of four Aden cannon. With a power rating of 4680, this is the most powerful gun armament listed here. All later fighters carried substantially less cannon firepower. Most air forces were satisfied with lighter gun armament than the RAF, and the introduction of homing air-to-air missiles in service soon led to a reduction of gun armament. Not listed here are the Gloster Javelin and the early models of the BAC Lightning, which could carry four Aden cannon, or two Aden cannon and missiles. The next group, from the late 1950 to 1970, contains the first supersonic and Mach 2+ fighters. In this time period many interceptor fighters entered service without cannon armament. Although multi-role and air superiority fighters often retained cannon, attempts to improve their firepower were limited. Guns fell victim to weight reduction programmes, or were (as in the case of the F-104 and Mirage III) installed as optional equipment packages. The Lightning F.6 entered service as a missile-only fighter, but cannon were retrofitted from 1970 onwards. The third group, from 1970 to 1990, all had guns designed into them, under influence of the US experience in Vietnam. Despite the introduction of several new types of cannon, none of these fighters exceeds the gun firepower of the Me 262 by a substantial margin – and the total weight of the guns plus ammunition is only about 300 kg or less. The same figure for the Me 262 was 413 kg, but one also has to consider that the ballistic performance of modern fighter cannon is much superior and the performance of sighting systems has been much improved. This allowed for some weight reduction; the Soviet fighters clearly have the lightest gun installations. Finally, the last group includes four fighters that are currently entering service. Here we see again an improvement in firepower, although the 30M791 and M61A2 are both direct descendants of older guns, rather than innovative designs. On the other hand the destructive capacity of the ammunition carried is decreasing again, to levels that are actually somewhat inferior to the better armed of the WWII fighters. This is defended with the argument that modern sighting systems are so accurate, that the hit probability is far higher than the 2% typically achieved during WWII, when aiming was mostly dependent on the skill of the pilot. Despite a reduced ammunition capacity and a gun redesigned to reduce the weight, the installation of the F-22 remains heavy in comparison with that of other fighters, without benefiting much in firepower. For the smaller JSF, Lockheed Martin at first selected the BK 27 revolver, then changed to the GAU-12/U five-barrel rotary, then finally to a four-barrel version of the GAU-12/U, designated GAU-22/A. This will only be fitted internally in the Air Force F-35A version; the STOVL F-35B and naval F-35C will have the option of carrying one in a gunpod under the rear fuselage. The GAU-22/A's maximum RoF of 3,300 rpm delivers a gun power of 2,800. The spin-up rate is not yet clear, but assuming it is the same as the GAU-12/U (0.4 secs), the gun power varies from about 1,000 (the half-second standing-start rate) through 1,850 (the full-second standing start). The length of time to reach the '2320 score' will be 1.17 seconds from a standing start and 0.86 seconds at maximum rate.